Tired of the Sisyphean cycle? Check out this beautiful poem, Reprocess, about time, the soul and the daily grind, by ErisianPen (homepage here). The poem was recently featured on deviantART. It is reproduced with ErisianPen's kind permission. made up of chrome and scrap metal. I'm born again each wet and cold morrow. and piles of scrap metal at the sides of the highway. 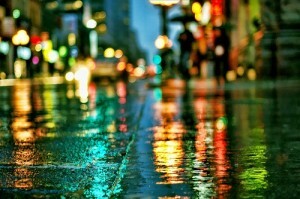 green traffic signals, wet and wide like floodlights. my eyes become the colour of rain. of heaven to where the elder clouds conspire. to labor under nuclei of recycled history. 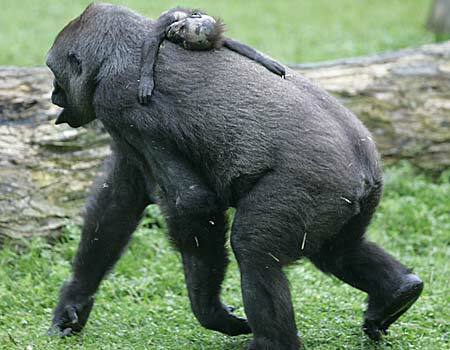 Münster Zoo: The grieving gorilla Gana carried her dead baby on her back for several days. 2008 reports here and here. Gana died in January of 2010. In yesterday's post, I touched on the commonly-held assumption that one of the things long considered to separate humans from animals is our awareness of death. This goes right back to the Book of Genesis, when Adam and Eve eat the fruit of the Tree of Knowledge of Good and Evil; they gain insight that makes them see things in the way God does. Yet they lack God's wisdom and judgment, possibly due to the fact that they did not also eat of the fruit of the Tree of Life, the other tree in the Garden of Eden. As a result, animals come to fear humans, whereas at the beginning of Genesis, Adam names the animals, which suggests his initial ability to communicate with them (to read the text, go here). In 2001: A Space Odyssey, Stanley Kubrick symbolically repeated that moment from a non-religious point of view when he showed apes making a jump in consciousness and killing tapirs with which they had previously lived peacefully. This was shortly followed by the now-conscious apes murdering each other while wielding tools to do so, with the tool-making the key sign of awareness of causality. Kubrick used an extra-terrestrial monolithic symbol as a catalyst for that jump in self-awareness. Cause and Effect: Time and Western Civilization? Time as a chessboard, not an arrow. 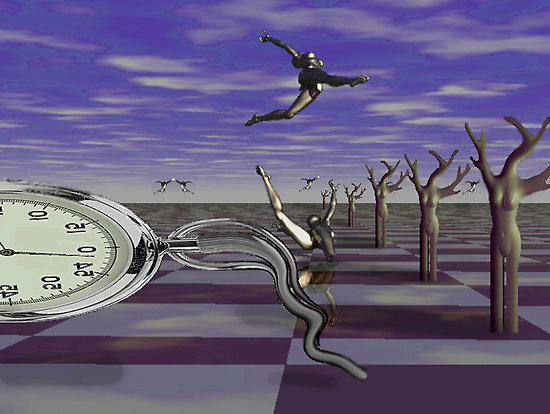 Ballet on Time Chessboard by Lawrence Alfred Powell. Image Source: Redbubble. In my post from November 25th, I discussed Stephen Hawking's assumption that time travel backwards is impossible. From MSNBC's report: "'Down at the smallest of scales, smaller even than molecules, smaller than atoms, we get to a place called the quantum foam. This is where wormholes exist. Tiny tunnels or shortcuts through space and time constantly form, disappear, and reform within this quantum world. And they actually link two separate places and two different times. The tunnels, unfortunately, are far too small for people to pass through — just a billion-trillion-trillionths of a centimeter -- but physicists believe it may be possible to catch a wormhole and make it big enough for people, or spaceships, to enter,' Hawking writes. 'Theoretically, a time tunnel or wormhole could do even more than take us to other planets. If both ends were in the same place, and separated by time instead of distance, a ship could fly in and come out still near Earth, but in the distant past. Maybe dinosaurs would witness the ship coming in for a landing. ... Ultimately, scientists may find that only travel into the future is possible, as the laws of nature may make travel to the past impossible so the relationship between cause and effect is maintained.'" I noted Hawking's reservations in my earlier post, "that time, the entire Fourth Dimension, must follow the rules of cause and effect. Incidentally, the principle of causality underpins the entire conception of western civilization, so it's interesting that Hawking has run headlong up against that brick wall and steadfastly backed away from it." Two things struck me here: first, that Hawking's assessment is so dependent upon the notion of this causality that he had to invent a wall of radiation or similar force to prevent the universe from acting in a way that he considers to be illogical. It looks like there is room for a blind spot here. Second, the principle of causality underpins practically every area of human inquiry, especially in the Western tradition, in everything from theology to the scientific method. Shanghai Time-lapse. Image Source: Chinatravel.net. 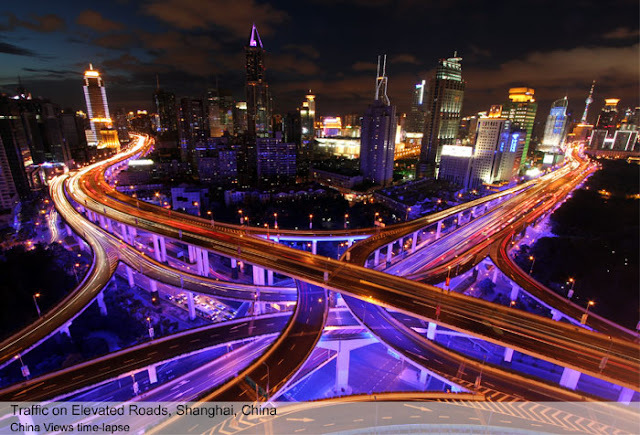 Image © Joe Nafis/Chinatimelapse.com. Look below the break for time-lapse videos that just caught my eye. These are accelerated scenes that give you a peek at the hidden objective lives of a country, a city, or a person, beneath our subjective experiences. 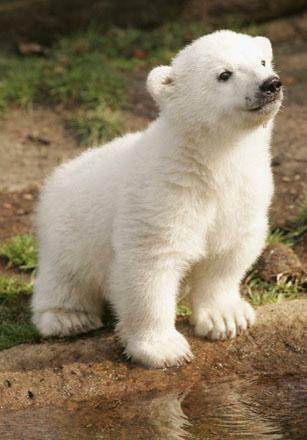 Thanks to my friend M. for reminding me that today is the fourth birthday of Berlin Zoo's famous polar bear, Knut. There's a report on his birthday special on German television on RBB here. I've always been a fan of Knut and was especially rooting for him when he stopped being cute, gained weight from eating too many croissants, and became unpopular. He went from superstar to underdog in a matter of months. Reports circulated that Knut had become 'a psychopath who will never mate' because he was addicted to human company.